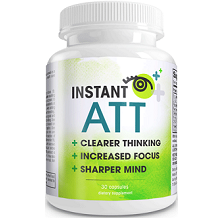 Our review is for +Instant ATT, produced with ingredients to help the brain to function at its optimum capacity. 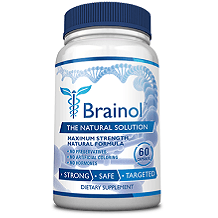 A nootropic designed to enhance the support of neurotransmitters which will increase blood flow to the brain as well as protect the brain cells and reduce stress, this product’s chief aim to help individuals who are struggling from feeling scattered and unfocused. It is also marketed to be a natural study aid to boost alertness. Other Ingredients: Silica, Lecithin, Microcrystalline Cellulose, Magnesium Stearate, and Gelatin. This product contains soy (Lecithin). N-Acetyl-L Carnitine is commonly used for patients with Alzheimer’s disease and improves mental alertness. St. John’s Wort is used to treat anxiety. L-Glutamine helps with memory and concentration. Bacopa is helpful with all types of mental performance. Bilboa supports general brain health. The dosage instructions for this product are to simply take one capsule each day. There is no information available provided by the manufacturer about side effects that may be encountered taking this product. However, as with the case of all supplements, if you happen to have a medical condition, or you are nursing or pregnant, you are advised to consult with your doctor before taking this product. It is only possible to purchase this supplement from the manufacturer’s website online. There are three packages of prices along with single or multi-packs for bottle purchasing. For one bottle, the price is $39.95; 3 bottles can be purchased for $89.95; 6 bottles can be purchased for $179.95. The price point for this product is not cheap so you will need to be sure you can afford this product if you plan to use it either short or long term. There is conflicting information on the manufacturer’s website and we are not sure which guarantee is actually correct. Under the “Support and Guarantee” section of the website, they say that they believe in their product so much that they offer customers 500 days to return the product from the date that it was shipped to you. However in the FAQ section of the website where the question is asked about their return policy, they state that customers are not satisfied with their purchase, they can return an item within 30 days of purchase. This product was produced in a GMP facility and in the USA and appears to be a promising product to help individuals who need help with concentration and the ability to focus better. But we have a few big question marks about this product. First, the price tag is really high and that is a game stopper for many individuals who simply could not afford the high price. Second, the guarantee is completely unclear if it’s for 30 days or 500 days, and we have not seen many companies offer a 500-day satisfaction guarantee. Third and perhaps most significantly, the manufacturer has not done a good job to explain its product, the ingredients, and why it has created their particular formula. Consumers want to be armed with facts about what they are buying. This product has too many question marks to earn a solid recommendation at this time.